At the risk of beating a dead horse here in blogland (and isn't that phrase doing it already?) I'd like to revisit the subject of J. Crew. This house of prep is having its best year ever: apparently, even if people hate investment bankers they don't mind dressing like them. The rulers of the free world (and their offspring) are gadding about with Crew threads on their backs, and J. Crew's sales are solid, even though the economy isn't. So, in lieu of another photo spread of fab new sweaters and sparkly shoes, here's an (partial) ABC Guide to All Things J.C.
A - Address. New York, NY. J. Crew's physical home is anywhere an American gets their catalogue in the mail. Their spiritual home is New England, where crew is still the sport du jour, and being a man with a pink popped collar won't get you punched in the face (as may happen in some parts West). D - Deals! J. Crew outlets are everywhere, and sadly (wrongly, evily, adverbially) they offer both discounted store items AND inferior imitations of their own store products. BAD J. Crew. Bad. But there is salvation. Check out the J. Crew Clearance Centers located near their distribution sites. Best one I know of? Lynchburg, VA. Set your GPS for 25 Millrace Drive. P.S. Rumor has it there's a 10% discount for students! 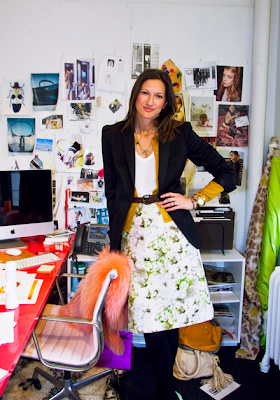 J - Jenna Lyons. THE original floral/sweater/ruffle/sparkle shoes diva. She can do no wrong. Her inspirations are brilliant, her style impeccable, and duh, her apartment is cute. Here is Jenna in her office, surrounded by brilliant ideas we're going to be wearing very soon. For more on Jenna at work, click here. J - Jewelry. J. Crew costume jewelry is fantastic: intricately wrought pieces that are inventive, versitle, and wear beautifully. The company has also recently branched into real jewelry of the passed-down-from-mother variety (true prep! ): pearls, and some darling little rings. The Official J. Crew Jewelry Philosophy is "Pile 'em On." M - Madewell. Madewell is a newer J. Crew brand with stand-apart stores. Madewell shops carry a mix of their own brand and others. The price point is supposed to be lower than J. Crew's (although intel reports otherwise) and the look is more bohemian. Think: stonewash, no pearls. Major gripe? The brand name is silly - it sounds stodgy and out-of-date (which, conicidentally, it is. J. Crew took the name from a now defunct workwear company. Frankly, it sounds like "Casual Corner" to me). O - Obsession. If you want to spend ridiculous amounts of time thinking about how to acquire and wear your Crew duds, look no further. Others with even more time than you have done all the hard labor. J. Crewaholics, J. Crew Aficionada, and I Heart J. Crew will tell you more than it's decent to know. S - Shoes. While I'm still as of yet unconvinced that some of J. Crew's pricier bags are worth the dough (everyone and their mother has hopped on the over-priced "it" bag bandwagon), their shoes are wonderful. The lines are classic and appealing from season-to-season, but there's almost always plenty of - for lack of a better term - shoe bling. Jewels, bows, leopard (sometimes all at once). They equal happy feet. W - Weddings. J. Crew is heaven's gift to brides. I'm going to make a completely shocking and totally unresearched generalization: J. Crew is IT if you are bride who wants tasteful looks in natural fabrics that won't result in a) financial bankruptcy, or b) friend bankruptcy (which is when your bridesmaids secretly dream of stabbing you with their credit card after they spend their last dime on your ego-centric organza monstrosity). Bridal gowns, $295 - $3,000. Be the sale: bridesmaids dresses frequently go on sale for $70 or less. Credits: Pic 1, J. Crew. Pic 2 - 4, Flickr. Pic 5, Huffington Post, photographed by Brandon Perlman. Pic 6, J. Crew. Pic 7, Madewell. Pic 8, J. Crew Aficionada. Pic 9, I Heart J. Crew. Pic 9 - 10, J. Crew. Thanks for the mention in your ABCs article! Great post..I had no idea there were entire blogs devoted to J. Crew! Delightful! And I'll happily start spreading the false rumor re housewares. If Zara can do it, why not J.Crew?! A great post-I agree with you-great clothes, jewelry, sales, shoes, bridal, and Jenna Lyons is brilliant. Outlets are terrible, Madewell is the worst name ever, and purses are underwhelming except for the Marabou clutch that I need. I wouldn't call it the house of prep though anymore. I hate preppy and I think Jenna Lyons has taken it way beyond preppy to elegant and sophisticated with gorgeous fabrics. Preppy underpinnings perhaps. 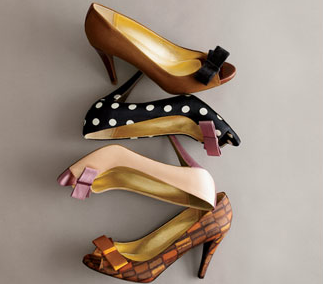 Love J.Crew this season. Just ripped a page out of the catalogue and bought cargo jacket and skinny lavender patent leather belt to cinch it with. Love the belts, the jewelry, the embellished tees, the cardigans. I haven't shopped at J. Crew in years but with all the hype lately, I may have to stop in one. You've definitely given me some good reasons! J.Crew has gone from being good to great with the guidance of Jenna Lyons. Her taste and style is impeccable. I love the preppy staples and additional pieces that have some elegant, detailed touches. I want to BE Jenna Lyons, her taste is somehow always impeccable, despite a strong emphasis on quirk. Adore her and J.Crew. The fact that the wedding dresses are actually silk and go for the price of polyester abominations from David's is a major plus. Their sale prices on wedding dresses are also fabulous. 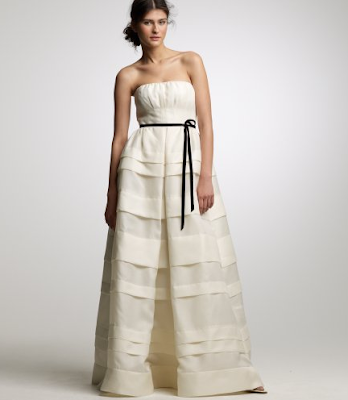 I called to talk with a rep from their wedding dept who tipped me off to a dress that was obscenely inexpensive. I hope my wedding still counts. Madewell sounds like it should be on the tag of Very Sensible Underwear.